ELLIOT (Elliott), ADAM, Church of England clergyman; b. at Nicholforest, Cumberland, England, baptized 19 Dec. 1802, son of Adam Elliot and Margaret Little; d. at Grand River (Tuscarora) Reserve, Ont., 4 June 1878. The Elliot family came to Upper Canada and settled in York (Toronto). Adam Elliot Jr presented himself to Archdeacon John Strachan* in 1828 asking for help in pursuing studies for the ministry. 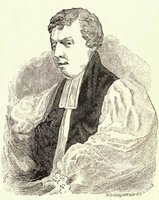 Strachan was impressed with Elliot’s earnestness and directed his reading until his ordination to the diaconate in November 1832. 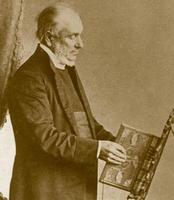 Adam Elliot then immediately began a five-year term of service as a travelling missionary in the Home District north and east of York. 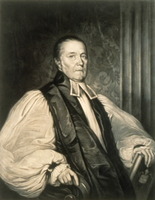 He received financial support from a local missionary society in Upper Canada and from the Reverend William James Darley Waddilove in England. Elliot’s journals describe vividly the pioneer conditions of the time, and his registers of baptisms and marriages reflect the faithfulness and untiring energy of the young missionary. 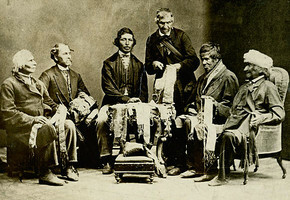 He ministered to the Ojibwa Indians, who had been concentrated in 1830 by the government at Coldwater and The Narrows (Orillia) under the charge of Captain Thomas Gummersall Anderson. A proposal by Anderson in 1835 to settle the scattered tribes of the north shore of Lake Huron on Manitoulin Island was approved by the lieutenant-governor, Sir John Colborne*, and Elliot obtained the consent of Bishop Charles James Stewart* of Quebec to be the resident missionary in the infant establishment in 1836. When the plan was temporarily shelved in 1837, Elliot returned to the Home District but was soon stationed for a short time at Beckwith in the Bathurst District (now in Lanark County). Elliot accepted a request in 1838 to work at the New England Company station near Brantford. The company had begun to take an interest in the Six Nations Indians on the Grand River in 1827. They appointed Robert Lugger* their first missionary at Brantford in that year, and he was later joined by Abraham Nelles*. 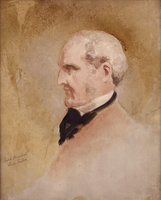 Lugger died in 1837 and in March 1838 Elliot took over at Tuscarora, where he carried on pastoral and educational work until his resignation in 1875. He died 4 June 1878 and was buried in the cemetery of Holy Trinity Church, Onondaga, Ontario. Shortly after moving to the Tuscarora mission Adam Elliot married Eliza Beulah Howells. Four children were born to them but none survived their parents. Emily Susanna Howells, Eliza’s sister, came to live with the Elliots in 1845 and helped to care for the children; that same year she married George Johnson*, Elliot’s Indian interpreter who also lived at the parsonage. Their daughter was Pauline Johnson*, the poetess. Eliza Howells died in 1849 and Adam Elliot married Charlotte Racey in 1856. The Elliot family papers are in the possession of Mrs Lawrence Crumb, Nashotah, Wisconsin. James Beaven, Recreations of a long vacation; or a visit to Indian missions in Upper Canada (London, Toronto, 1846), 30–55. New England Company, Report, 1840 (London, 1840); Report, 1868 (1869); History and report, 1869–70 (1871) ; Report, 1871–72 (1874) ; Six years’ summary, 1873–78 (1879). Dominion Churchman (Toronto), 23 June 1878. The Stewart missions; a series of letters and journals, calculated to exhibit to British Christians, the spiritual destitution of the emigrants settled in the remote parts of Upper Canada …, ed. 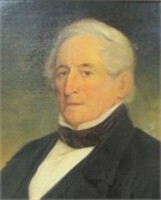 W. J. D. Waddilove (London, 1838), 29–96. W. P. Bull, From Strachan to Owen; how the Church of England was planted and tended in British North America (Toronto, 1937). A sketch of the origin and the recent history of the New England Company by the senior member of the company (London, 1884). Dorothy Keen and Martha McKeon, “The story of Pauline Johnson, Canada’s passionate poet,” as told to Mollie Gillen, Chatelaine (Toronto), XXXIX (February, March 1966), 25f, 39f. T. R. Millman, “ELLIOT, ADAM,” in Dictionary of Canadian Biography, vol. 10, University of Toronto/Université Laval, 2003–, accessed April 24, 2019, http://www.biographi.ca/en/bio/elliot_adam_10E.html.